Looking for a variety of lemons to add that special "zing" to your cooking repertoire in one package? 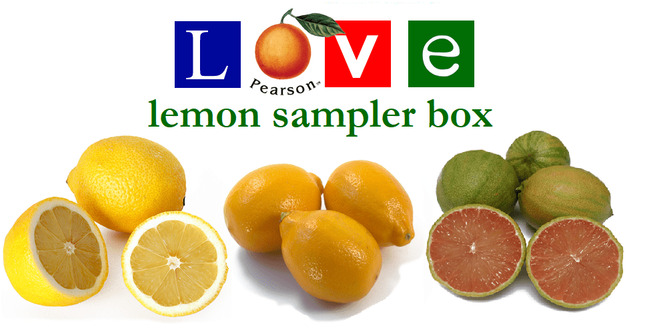 Pearson Ranch has your lemons, with our new Lemon Sampler Box! When they are in season and available, we will ship you a 5 pound mix of our Meyer Lemons, Pink Variegated Pink Lemons, and our "Regular" Lemons. Imagine creating your own recipes with lemons that will just "knock the socks off" your family and friends. How about a Meyer Lemon or Pink Lemon Meringue Pie? Try grilling up a piece of fresh salmon with pink lemon slices? Or even mixing up a batch of lemonade with all 3? Yes, the "tangy" sky is the limit. So open up your favorite cook book or download those recipes you have been waiting to try and unleash the citrus "magic" in your kitchen! These 3 different lemons come in 5 pound quantities. The actual number of pieces in the box will be determined by the size of fruit being packaged at the time of order fulfillment.